We decided to venture out in search of some new spots, so we headed out towards Birchgrove. There were a few people fishing there already, surprisingly on a weekday, and the parking was ridiculously hard to find due to it being a residential area. We tried all sorts of bait, but were not able to get anything more than some undersized bream. The wind was picking up, along with our parking time, so we headed towards the city to continue our day. There were plenty of yellowtail at our next destination and we put some fillets out as bait. Again, not much on offer with the odd bream and snapper. 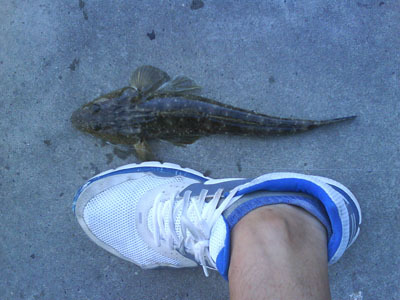 I also landed a flathead just under legal.